I recently experienced stability problems on a new work computer, which crashed with a BSOD. The computer has rebooted from a bugcheck. The bugcheck was: 0x0000004e (0x0000000000000099, 0x00000000003def55, 0x0000000000000000, 0x0000000000000001). A dump was saved in: C:\Windows\MEMORY.DMP. Examined the memory dump with WinDbg (x64). available get the stack trace. Memory problems are typically caused by failing memory modules, so I tested the memory with Memtest86+. Only had time for running it for a short time, but it passed the test once. The computer has rebooted from a bugcheck. The bugcheck was: 0x00000050 (0xfffff8a0384b1280, 0x0000000000000000, 0xfffff800031fe133, 0x0000000000000000). A dump was saved in: C:\Windows\MEMORY.DMP. Arg2: 0000000000000000, value 0 = read operation, 1 = write operation. 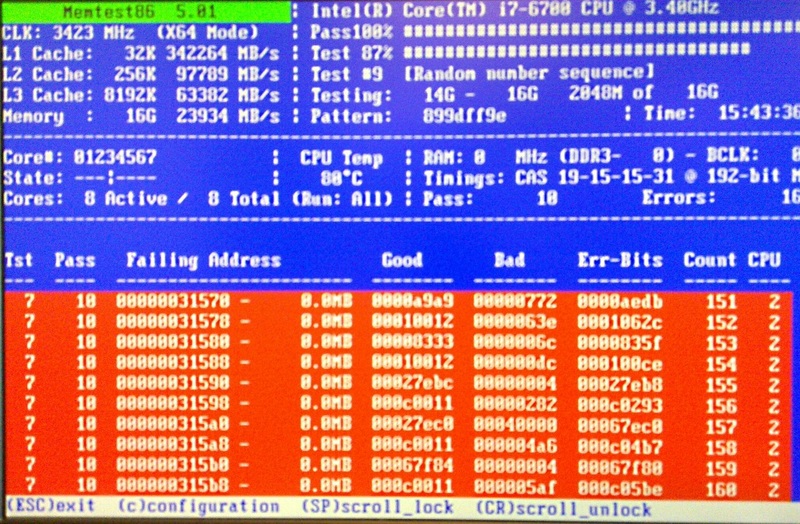 Another BSOD related to memory access strongly indicated problems with the memory modules. Ran Memtest86+ overnight for 15+ hours. I decided to reseat the memory modules. 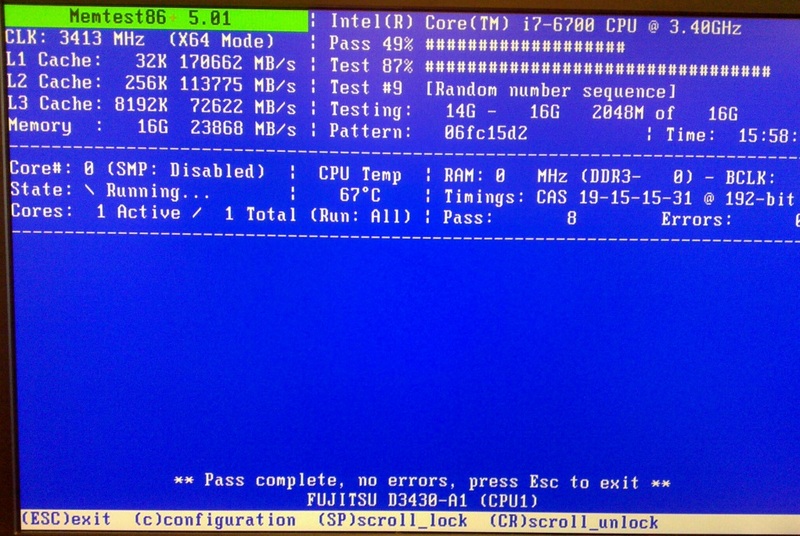 Then ran Memtest86+ overnight again for almost 16 hours. The next day no memory errors were found. Hoping that the cause and solution for the BSOD crashes has been found. Time will tell. A Lenovo Thinkpad T440p computer recently crashed with a BSOD. The computer has rebooted from a bugcheck. The bugcheck was: 0x0000001a (0x0000000000041792, 0xffff808000082f70, 0x0004000000000000, 0x0000000000000000). A dump was saved in: C:\WINDOWS\MEMORY.DMP. the PTE. Parameters 3/4 contain the low/high parts of the PTE. This issue indicated hardware failure, most likely defective memory. 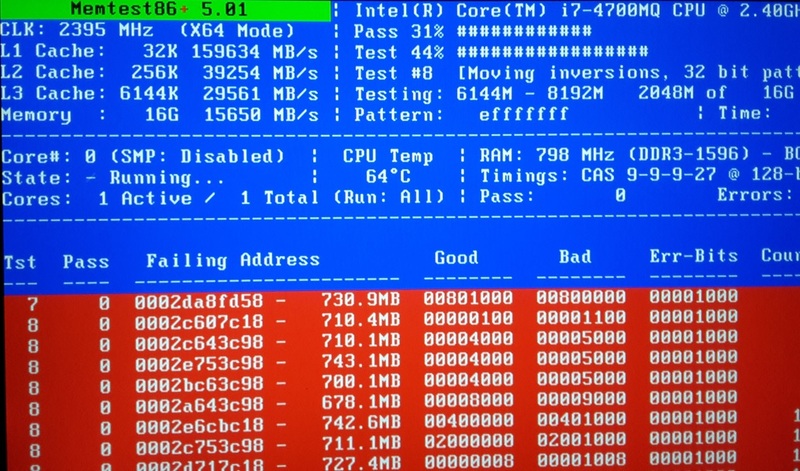 So I booted Memtest86+ from a USB drive. Within few minutes it found multiple errors. Tried cleaning the contacts on the memory modules, but it had no effect. Then I tested each memory module separately in both sockets. In every case the memory test found errors. Decided to test another 8 GB memory module. Ran Memtest86+ all night and it found no errors on the replacement memory module. A computer that crashes with a MEMORY_MANAGEMENT (1a) BSOD likely has defective memory. Test the memory with Memtest86+ or another testprogram. Then replace any identified defective memory modules.